As the forecast predicted strong afternoon storms on Saturday we “moved” the visit of our "project" in Marmolada to Monday. My climbing partner Luka Kranjc find out “something shorter” for Saturday – rarely climbed Via Sandro Pertini in the west wall of Cima Grande. The route actually wasn’t climbed free jet, and although climbed as late as in the eighties, it falls in the category of techno-direttisimas. We climbed the route in 6 pitches, enjoyed unusually good rock (for the Tree Cime Group) and we managed to free all the pitches including crux one over the huge roofs. The difficulties were up to 6b, with crux around 7c. The route has all characteristics of the modern alpine free classics and we really recommend it. It’s mostly bolt protected (old Cassin ones), but you need a set of friends and nuts for supplementary protection. Start left of big tower, about 15m left of Dülfer, and follow slings, pitons and bolts. Check a topo and few shots of this route on link belowe! After rainy Saturday night we spent Sunday to rest and then to move to the base of south wall of Marmolada. Over a month ago Luka and I already "opened" our project called Via Cattedrale there. Then, in the lover part of the wall, a waterfall blown by the gusty west winds made us totally wet every few minutes. We were soaked and cold and the route was quite wet in places too. 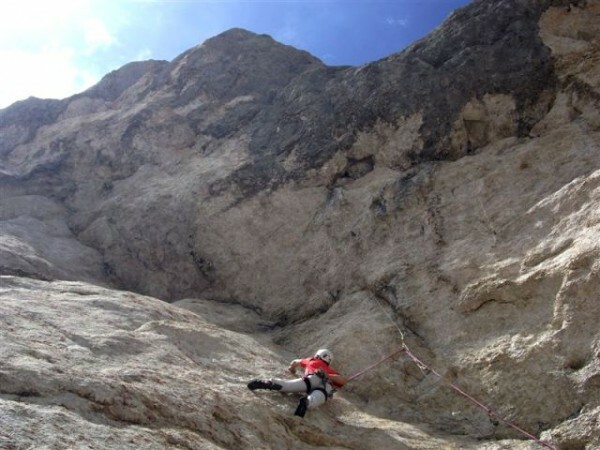 However we “fight” to the tenth - most difficult pitch (8a or. 8a+). We found out that this very technical, as well as endurance pitch will not be really easy. Luka had somehow given up, but I managed to figure out all the passages and moves. But as there would be 400 meters of climbing above us there was neither time nor power for serious free attempt. This time the wall was totally dry, no waterfalls. We climbed fast up to the hardest pitch. Luka studied all the moves and than I try the pitch. But I mix up few of the moves in the second slaby crux. My second try went smoothly, to the belay! Perfect! I was lowered down and than Luka went for fight. To his surprise he did all the slaby cruxes and fight all to the last hard move in the overhangs.... and there he stuck. Time for yet another attempt was gone and so we speed up to the end of the route which we reached in the fog and just before the darkness. Really shame that Luka missed a free ascent by just a move, but I’m shore he will free climb the route on his next visit!